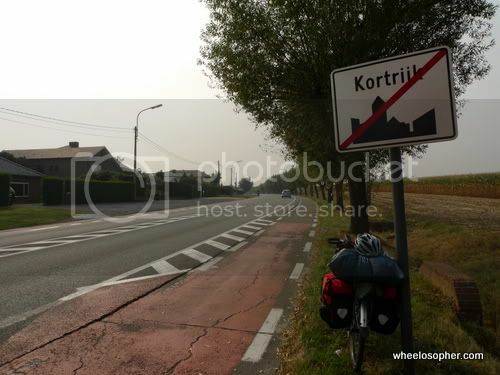 Day 16, Sun 20 Sep, Kortrijk to Roubaix to Paris. Breakfast was a simple affair. I went to the kitchen for my tray which contained the cutlery, butter, jam and milk. The rest was on the buffet – cereals, apples and oranges, yogurt, bread, ham, cheese, and a choice of hot coffee, tea or chocolate. Not a bad spread for a hostel. There weren’t too many guests that day so it was a nice relaxing breakfast. I took my time…in fact, I overdid it and was told by Johann that checkout was 10am and it was already close to 10. 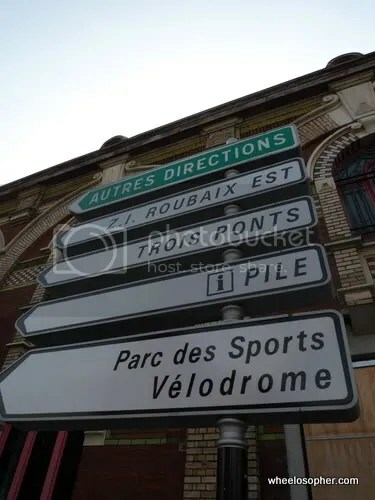 As I readied to leave, Johann once again came to my assistance, giving me a small map of the town with directions to get out of it and, a list of towns to tick off on the way to Roubaix. Thanks Johann, you’re a godsend. My first samaritan of the day ... all colour-coordinated, too. You know when you're leaving town. 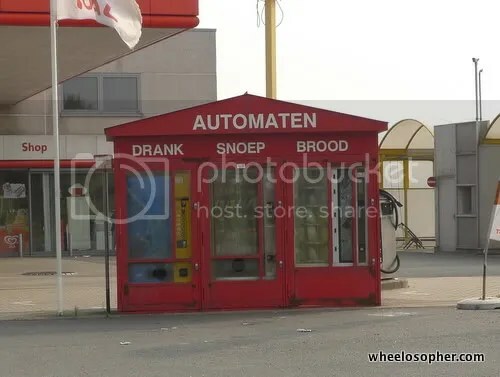 Just outside Kortrijk, I couldn't help noticing that things got a little automated. Drank = drink, snoep = snack, brood = bread. 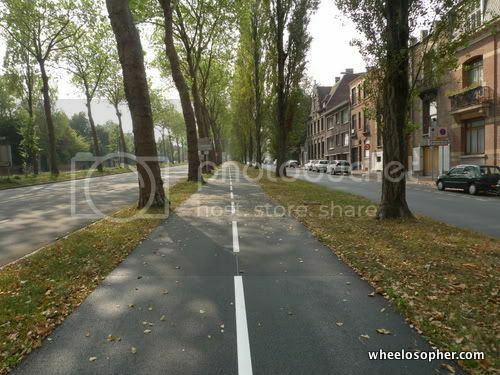 From now on, I would be cycling along main roads, although still on designated sections marked for bicycles. It was faster though. It took me only about 2 hours to ride the 30kms or so to Roubaix. Somewhere in between, I’d crossed into France, and the signs had changed abruptly to French. 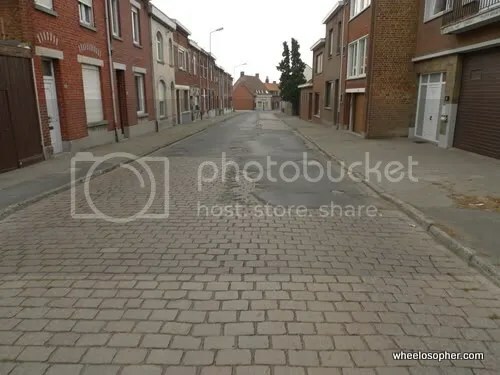 Another sign that indicated that one had left Belgium was the general cleanliness of the town. Roubaix was scrappy-looking. Rubbish was everywhere, and some of the houses looked drab and rundown…. even the people looked different. 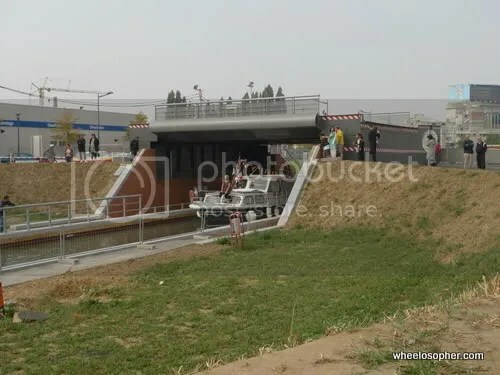 I had just entered Roubaix, and at this particular roundabout over a canal, 2 opposite sections of it could be elevated to allow boats to pass through. Not the most convenient of arrangements, as traffic built up about 100 metres or so. Not sure of directions, I asked this friendly French boy and he drew me a map to get to the velodrome. 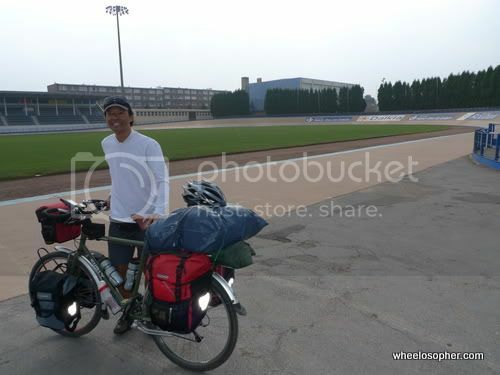 I circled around a bit and finally made it to the velodrome. It wasn’t some grand piece of architecture but it was hallowed ground – having been the finishing point for the infamous Paris-Roubaix Race for the last 119 years. 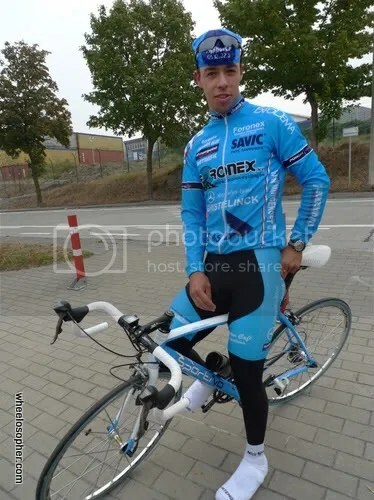 250km and some of it on cobbles that were so bad, people just didn’t use it in normal times. The main gate was closed but not the side gate, which was strangely open. I saw a group of cyclists already inside. There were Brits, from Cycling Club Hackney, and they were here for the same purpose as I was. Their leader, a guy by the name of Keir, was a bit apprehensive about us all riding the track and said we’d better not, and that somebody might be watching and all that, because normally velodromes aren’t just open like that. So we just posed a bit at the trackside. The boys were a bit cheesed off that they didn’t get to ride after coming from so far. As for me, I’d decided that as soon as they were gone, I’d go ahead and ride it anyway. After all, the worst that could happen was probably somebody telling me off, and it would be worth it, too. 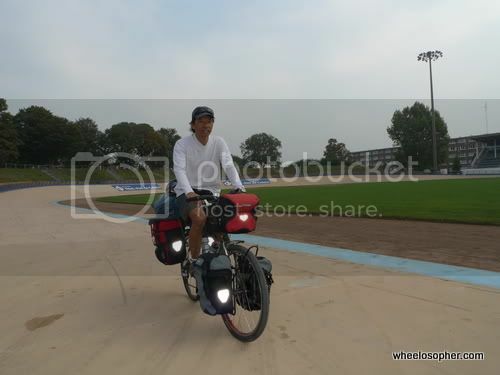 I took to the track just as they were leaving and as soon as they saw me on it, they hesitated going off. I could tell the boys were telling him ‘See, it’s alright, let’s do it’. Next thing I knew, 2 of the boys zipped past me ( a fully-loaded tourer is like an elephant lumbering along while the thoroughbreds went past me like lightning). The sidegate was open, so I went in. 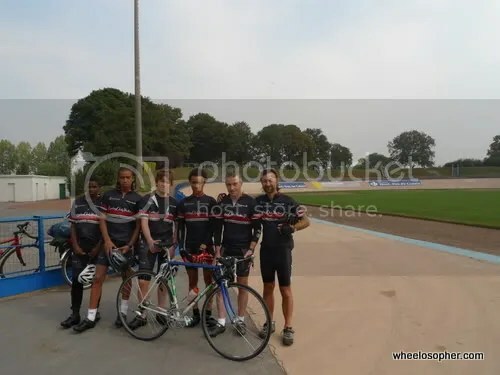 So did this group of pilgrims from Cycling Club Hackney, England. With that crossed out of my things-to-do-list while in Europe, I headed for Lille, about 20 kms away, to take the train for Paris. 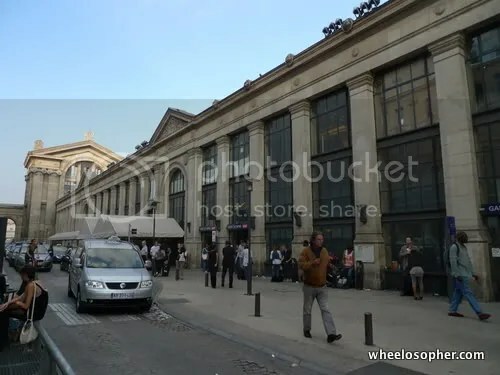 (I was behind time and I had no choice but to take the train other wise it would be another 3 days on the road and I wouldn’t be able to enjoy Paris). 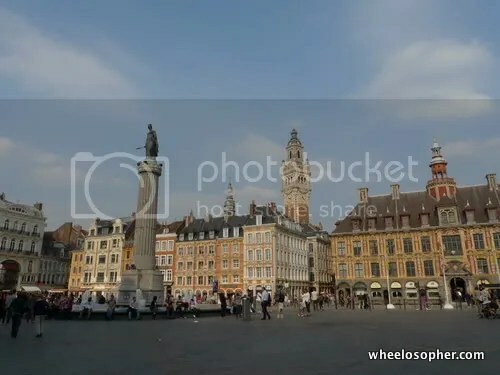 To get to Lille, one simply rides on the Grand Boulevard, an old road that has dedicated tram lines, cycle paths and a dual carriageway, all flanked by beautiful trees the leaves of which were already changing colour, covering the street below with a golden blanket. I rode a little slower to enjoy it. 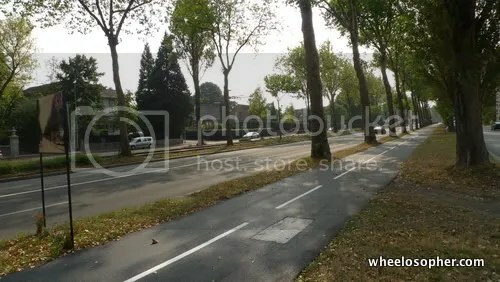 On the extreme left is the road for cars, followed by trams, then a fast road cars again, then the 2-way cycle path, then another road for cars. As I was riding along, a cyclist came up to me with the usual ‘Bon jour.’ I bon jour’ed back and we started chatting. 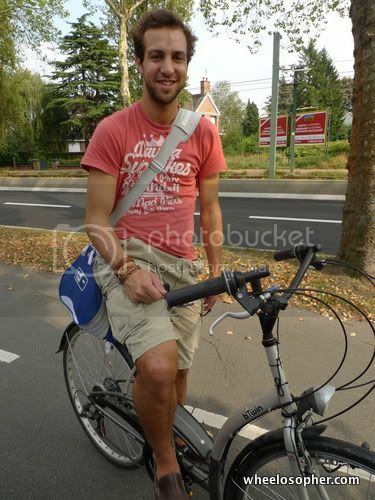 His name was Jean Chevalier, he was on his way home from his work as a communications executive with a bicycle manufacturer, and he was another like-minded soul. 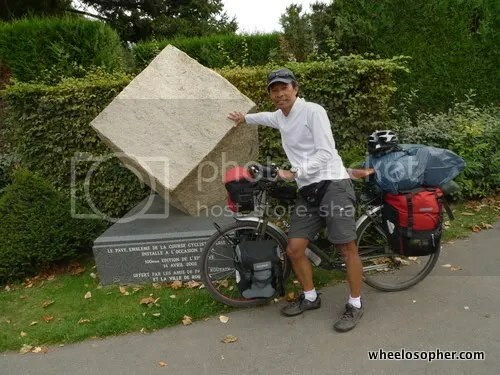 He started telling me about his ambitious plans for a long cycle tour that would be taking place early next year – India and across Australia. 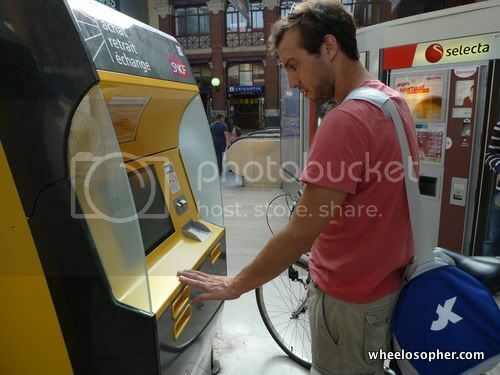 We chatted almost all the way to Lille and he decided that he would take me to the train station, and help me buy a ticket. I love it when I meet such people on the road. They really do make my day. 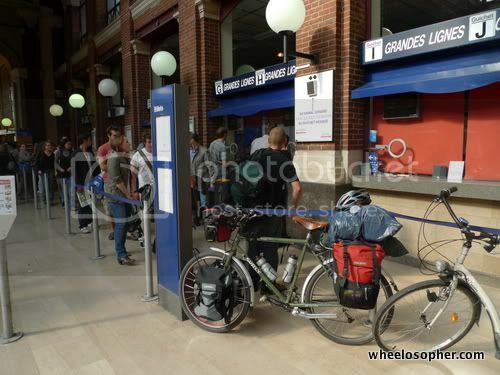 Like elsewhere in Europe, bikes inside train stations do not raise any eyebrows. 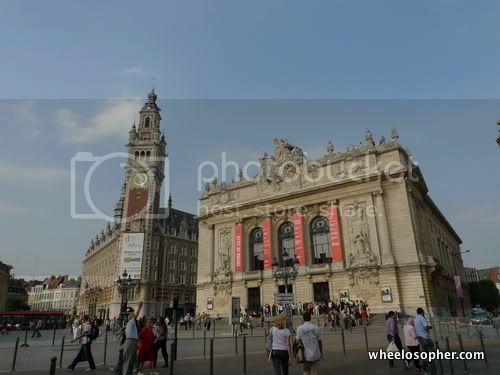 The picturesque town of Lille. 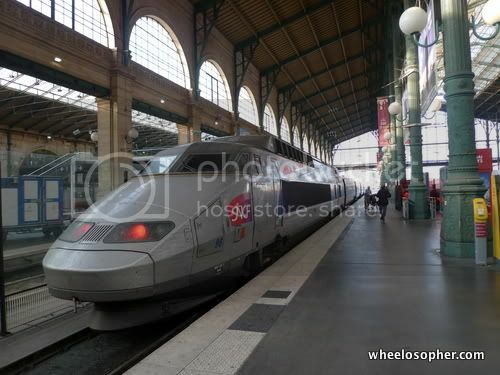 The non-stop train to Paris cost me 64 Euros (ouch), including bike, of course, and it took a mere 1 hour 4 minutes to cover the 220 or kms. 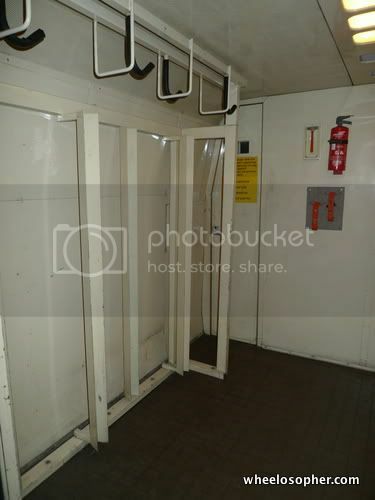 The carriage for cyclists offers a special room to store bikes, hung up by the front wheel (I'd forgotten to take a picture). 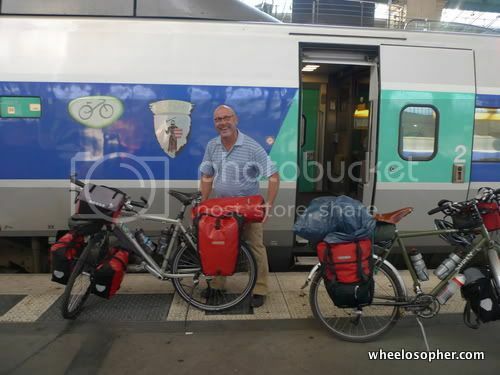 A fellow tourer (enroute to Spain) who was on the same train with me. 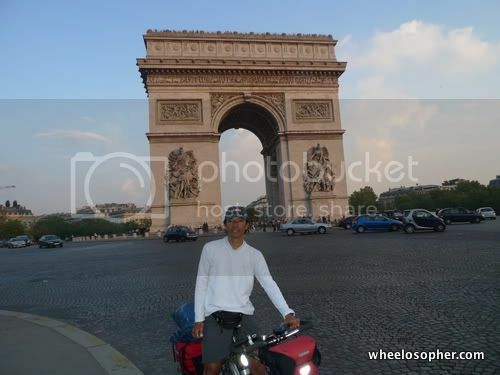 It felt great to be finally stepping out onto the Parisian streets --- it was busy, noisy, colourful and beautiful. Enroute to the campsite at Bois du Boulogne on the eastern side of Paris, I stopped to take in the sight of Arc de Triomphe, basking in the warm glow of a setting sun. Tomorrow, I do the tourist thing, along with the thousands of other visitors from all over the world.